November 6th, 2018 - ExpertPdf HtmlToPdf Converter v12.3.0 was released. 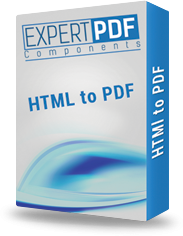 The ExpertPdf HtmlToPdf Converter fully supports HTML5, CSS3 features, including canvas, svg, page breaks control with CSS styles. Adding HTML in the headers and footers is also supported. Full ASP.NET MVC Samples are available in C# and VB.NET. Please note that the export is done using the default properties. Download an HTML To PDF evaluation version and you can change the headers, footers, page size, page orientation, and many more properties. Buy the ExpertPdf Toolkit and get 10 components with a big discount. Buy the ExpertComponents Toolkit Total and get 11 components (10 pdf tools + Excel library) with a huge discount. ExpertPdf is the best html to pdf converter for .NET. Using ExpertPdf html to pdf api is easy to convert asp.net pages to pdf. ExpertPdf Toolkit is a suite of PDF tools that cover the majority of PDF related needs in applications written using the .NET Framework. The Toolkit contains a lot of powerful components: html to pdf converter, pdf creator, pdf merger, pdf splitter, pdf security library, pdf to text converter, pdf to image converter, rtf to pdf converter, pdf images extractor, pdf viewers. ExpertPdf sample code for Html To Pdf Conversion in ASP.NET MVC. Learn how to convert from HTML To PDF.